As professional locksmiths, we can’t tell you how many clients we’ve met who are profoundly misinformed about the nature of locks, keys, and locksmiths. This isn’t anything against them — Locksmithing 101 isn’t exactly the most riveting bathroom reading material. However, it does make us feel the need to help people to be aware of some of the falsehoods that are often circulated about these things. 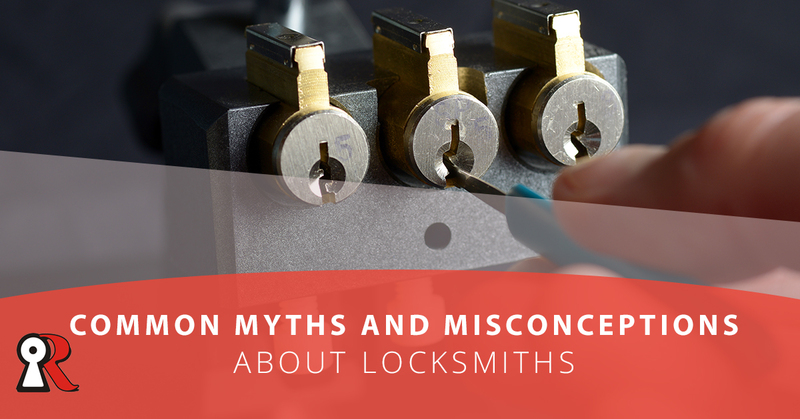 In this blog post, we’ll go over a few myths and misconceptions that people often buy into about locksmithing. Don’t believe everything you hear! In reality, there are no legal penalties for copying a “do not copy” key. A lot of hardware stores do it, and most locksmiths won’t hesitate to replicate it for you. If you’ve lost your spare house key or you’re wanting to make a copy for a family or friend, don’t let that little warning scare you away. We’re not sure why a lot of people think this since it can be disproved if you watch literally any locksmith do their work. Locksmiths, when given a key to replicate, take one and then give back two. There is a paranoia that locksmiths keep duplicates, but all you have to do is look at what they’re doing — we can guarantee nobody is slipping extra copies of the keys they work on into a secret stash. Usually, asking if anything in real life compares with how it’s depicted “in the movies,” the answer is almost always a solid no. As it turns out, lockpicking is no exception. In Hollywood, it seems like anyone can pick a lock, and rather quickly at that. These characters also seem to conjure up lockpicking tools out of thin air, when in reality, lockpicking tools are restricted or even illegal in certain regions. Do yourself and your locksmith a favor by not assuming real life is anything like the movies. Locks are designed to keep people out, even those with extensive and professional training in lockpicking, and it’s possible that your locksmith could be there for a while. Don’t rush them — in real life, it’s actually a tough job. You may be right on the first one, but you’re dead wrong on the second. Lockpicking is an advanced trade that takes extensive amounts of experience and training. Even if you had the tools on hand (highly likely that you don’t), the bottom line is that picking locks just isn’t as easy as it looks. And sure, you could break a window. There’s nothing stopping you. However, it’s almost always cheaper to hire a locksmith in the long-run, and you completely avoid injury in the process. There isn’t a compelling reason to damage your car or property is there’s a locksmith within a reasonable distance. If you’re in or around the Redlands area and you need any form of assistance at all with your locks and keys, give us a call! We’re a boon to any client in the area, and we’ve helped countless people with new locks, new keys, and all kinds of other useful services. What are you waiting for? Contact us today!